The tailhook implementation in FSX and its successors is a bit unrealistic. I only realised this when I was developing the Firefly and couldn’t get it to land without nosing over. When watching from the external view I saw the hook remained fully down even after the wire is caught, which would require a much stronger structure in real life and cause all sorts of issues. The screenshot below shows how it affects the Firefly. This has not gone well. To get around this I added some code to the engine gauge dll that partially closed the hook after a cable is caught. Theoretically for the Firefly it should close fully as that’s how it worked in real life with the hook locking back up, but that causes the wire to release in FSX. 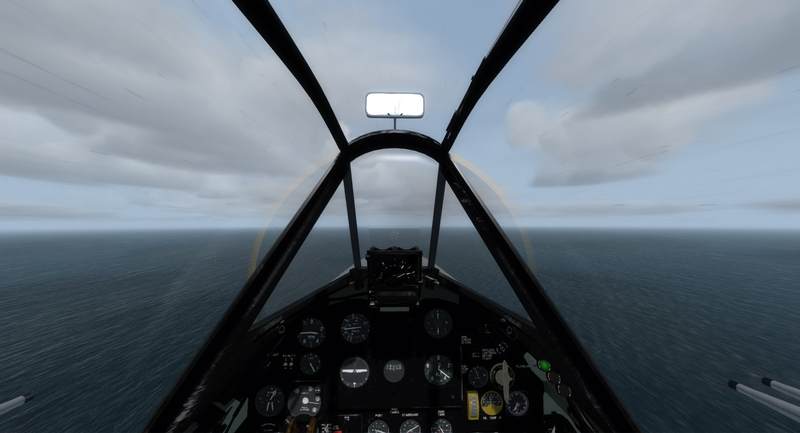 That code worked fine in FSX and P3Dv3 and lower. For some reason though, when I ported the dll to P3Dv4 although all the other functions worked the bit that asks the simulator to be told when a wire is caught didn’t work. I didn’t realise this when I was doing my testing as, well, it worked before so why wouldn’t it work now, and isn’t it a long time since I’ve done carrier landings, that must be why they’re so sketchy! An hour or so with a test gauge telling me what was going on demonstrated that in fact, the one bit of the gauge that wasn’t working was the bit that controlled the hook. After a bit of head scratching I’ve added the request to be told about the wire to a block that asks for lots of other information on the aircraft, and for no obvious reason that works. After a bit more testing everything seems to be working as it should now when you catch a wire. If you compare the angle of the hook in the photo below you’ll see it’s only about a quarter open which holds the aircraft at a nice flat angle even if you punch into the wires a ‘bit’ too fast. Rubbish visibility but a decent trap. This will all be making its way into the next update, once I’ve finished getting TacPack to work with the Firefly, in the meantime if anyone wants to replace the two affected DLL this zip file has them both. The GriffonII.dll goes in the Firefly F1/Panel folder, GriffonXII.dll goes in the Firefly FR1/Panel folder. These are for P3Dv4 only as the FSX version should already work. I know some people have found deck landing a bit tricky in the Firefly, and to be honest the main reason I don’t is probably because I did it so many times in testing before I got it right! A useful instructional video from the 1940s is available on youtube https://www.youtube.com/watch?v=qxtXDDShjGs and is worth checking out for hints and tips. Author skippybingPosted on December 4, 2018 December 4, 2018 Categories FireflyLeave a comment on Let it rain! I’m slowly progressing the Seafire, but as mapping the undercarriage takes a long time and doesn’t make for great screen grabs I thought I’d take a break to add TacPack to the Firefly. I’ve got the cannons working so far, the next stage is to integrate it with the loading panel and cockpit switches, and then add rockets and bombs. Practice runs were made taking out my frustrations on RyanAir! The gun sight is slightly low as it doesn’t account for the angle of the guns but that’s an easy fix.